Stok Kangri Peak situated at 6152 M is the most elevated Peak in the stok scope of Himalayas. The pinnacle is situated in Hemis National Park and its unmistakably noticeable from Leh and encompassing zones. Remaining at the summit of Stok Kangri, you can see the Karakoram Range to your north and Zanskar Range to your south. A standout amongst the most entrancing destination on earth is Stok Kangri that lies in the wonderful territory of Ladakh. Ladakh is situated in the northern territory of India and is celebrated for sympathy and backing of its inhabitants. Leh the capital of Ladakh is arranged at the tallness of 3500-3800 m of ocean level and the bravest destination for the trekking lovers. Trekking in Leh is the best and it grabs the attention of the visitor from each edge of the world. Stok Kangri is one such pinnacle that has increase gigantic prominence over the most recent couple of years. Delineating the Himalayan range with a more extensive viewpoint, and offer its trekkers the chance to encounter the total harmony. The whole trail has numerous edges so you can feel the sudden change in landscape. In winter, the entire scene accomplishes an ideal gloriousness. Stok Kangri top gives you the whole perspective on Zanskar and the Indus Valley. Your trek starts from Delhi as you take the flight or the road trip to reach the destination from where the real adventure begins. it’s 8 days total trek with full of challenges and adventure, you will witness so many eye-pleasing destinations on your way to Stok Kangri trek, and you will so experience the ancient culture the Leh native still follow and the festivals they celebrate with all the colorful senses. One who has an experience of trekking are the one who can pursue this trek , this trek is not for the first timers and even the experience one needs to have a good and this could be the most magnificent and incredible journey for the trekkers as the destination is well known for its beauty and trekking. No, it is not at all favorable for children; kindly do not pursue this trek with kids. No, we do not recommend this trek for the first timers, families can choose but if they have a prior experience as it is a difficult trek. One can attain a maximum altitude of 20,180 Ft. subject to his endurance and other conditions such as a climate, temperature. This trek isn’t easy at all so one must prepare themselves mentally and physiologically before choosing Stok Kangri as this trek has so many complicated ways to cross. Season! Best season to visit Stok Kangri is between May to mid October as the place is pleasant and one can get easily indulge in the temperature, the view stays clear and beautiful in May to mid October. The average temperature in the day time will be 20°C to 30°C, and falls in the night. It is essential to bring enough warm enough, and that may not even affect the backpack too much. Stok Kangri is one of the most astounding trekking crests on the planet. It remains at the height of 20,180 Ft. It beats two of the most noteworthy mountains crosswise over two unique mainland’s and is, the point of fact, a delegated gem of India. The greatest and the main amid Stok Kangri trek is the summit day, where you need to overcome below zero temperatures, trek on an ice sheet for around 6-7 hrs during the evening, and stroll on the ridgeline for about 2 hrs to achieve the summit. 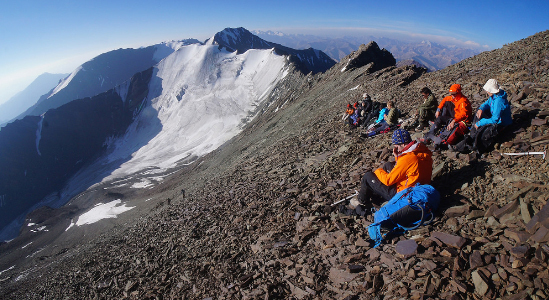 The view from the Stok Kangri summit is the wonderful experience and a daunting task. You can see the Karakoram go from the Stok Summit alongside the Zanskar run. Stok Kangri is an ideal trek and each eager trekker's fantasy. Therefore nothing can be compared to Stok Kangri; every trek lover can understand the dream of Stok Kangri summit. Your journey to the beautiful destination will start from Leh nestled in northern India, Capital of the Leh region in Jammu and Kashmir. Leh is roasted at an altitude of 11,562 Ft, is most known for its Buddhist essence and nearby trekking areas. Earlier Leh was the significant trade route between Tibet and east, Kashmir to the west and also between India and China, the two beauties Jammu and Kashmir, where lies Ladakh in between, the most admired destination for every individual across the border even, people since ages are traveling to behold the shining diamond Ladakh. You can choose either road to reach Leh, or you can take a direct flight from Delhi to reach this destination, though by road it will consume a lot of time and energy, flight will be more convenient as it will take approx 1 and a half hrs, basically Leh is most known for its Buddhist essence and nearby trekking areas. Day 2nd will be the day to acclimatize yourself to the weather and the altitude itself, and the briefing about the whole trek, points you should keep in mind before going futhure, etc, and in your free time you can stroll around and acclimatize yourself. Experience the culture and visit nearby famous places and temples along with that can shop in the local market of Leh whatever you like; Leh is rich in culture as it is an amalgamation of Buddhism and Tibetans culture. You can witness a lot of things such as Buddhist monasteries built in ancient times, the rock carving and the peace of monasteries grab the global attention. You can see and experience so much there, but as it is nestled at a higher altitude so it is necessary to keep yourself indulge in the weather of Leh so that it will not become the hindrance in your futhure trekking. Leh could be a dream trekking destination for many, so many among you can live their dream of trekking which will start from 3rd day, when you will drive from Leh to Stok village it may take approx 30 min reaching Stok village, in between the drive you will witness the astounding scenery and exotic places around, and will look like a heaven to you, drive to Stok village will have a different adventure, the town is enveloped into the lush green trees and the abundance of natural beauty , the city lies in the south of Leh and is well known for the royal palace, from Stok village you will start your trek towards Mankarmo which is at an altitude of 13,940 Ft. and may take 4 to 5 hrs to reach there and this will be the destination for 3rd day, trekking is a little hard so one must be aware of it in advance. On the 4th day, you will trek towards Stok Kangri Base camp which is nestled at an altitude of 16,400 Ft. It will take 2 to 3 hrs trekking on 4th day, it would be better if you will start the trek early because the time that is defined is according to the average distance, but it entirely depends on you how much you can walk and how much time you will take because the trek isn’t easy. It has a problematic ascent throughout the way, and the more you will go towards Stok Kangri, the higher level of altitude will start decreasing the level of the oxygen, and it may become little challenging for you to walk therefore it is essential to prepare yourself for the trek earlier. You will pass through the narrow trails in the mountains, where you must trek carefully, as you will reach the high altitude you can face the problem while breathing in climbing. Later, when you will cross the hissing river and then the trail will become little smooth and broader but still the way will be ascending along the way you will go through numerous alpine Lakes and tinny ripples, and Mother Nature will astonish you in each step. This trekking session will over, and you will reach the Stok Kangri Base Camp, rest and have a good time after so much efforts else you can climb little peaks nearby to prepare yourself for your expedition further. 5th day will not be hectic as you will again take the halt before the summit, this day you will acclimatize yourself with the weather again as now you are on the different level of height, so it’s necessary. You will take an acclimatization walk 17,700Ft. To get into the weather properly and to prepare yourself for the further adventure that will come to your way. It is essential to prepare yourself for the coming days your trek guide will let you know about the further challenges you will face, and other vital majors that one must keep in mind as Stok Kangri isn’t an easy trek. You must listen to your guide carefully and each point he/ she will let you know along with that you can explore the area. Meadows carpet and you may witness the sheep grazing there; you can talk to the shepherds and understood more about the place out of curiosity. Later have your dinner, rest and sleep you wake up early for facing the adventure. 6th day will be the most challenging as well as the adventures day for the trekkers. It would be better to start the climb earlier as it will take so much time to reach the summit. The route will go through the glaciers that will make it hard to climb so be careful once you will pass the iceberg, there will be a steep way with slopes to the summit ridge. It will be a long climbing day so you must be mentally and psychologically prepare to reach the summit as it won’t be an easy trek, it will take 9 to 10 hrs for the average climber to reach the peak, and for the slow climber, it will be like 2 or 3 hrs in addition. After this hard climb when you will reach the glacier, the real rise will start from here to the Mount Stok Kangri top now it will take approx 2 hrs to reach the summit again climb carefully because your one mistake can drag you into the danger. As you enter the peak, your wait will be over, and your efforts will treat your eyes with the most beautiful view of the Karakoram Range in the north and the Zanskar mountain range in the south. It will be a pleasant view from the top; you will get the unobstructed picture of the summit and the colorful Buddha prayer flags that is just a delicious s treat to the eyes, there you can click pictures and enjoy harder. Later you will come back to the base camp and you can celebrate your victory over the hardest summit. As you will be done by the 7th day, so now a time when you will see you way back to the Leh. You will trek back to the Stok village with enthusiasm and the feeling of winning that you have completed such a hard trek, from Stok village you will get the vehicle to go back to the Leh by capturing this beauty in your eyes you will drive back to the Leh from Stok village. 8th day will be the goodbye day from Leh as you will travel back to your homes from Leh via flight with all the memories you have created in these 8 days and the bonds you made will always be with you. So one must trek always you gain a better experience and lessons in life. The trek beings with your arrival at Leh, you can arrive Leh by flight that may take approx 1 and 1:30 hrs to reach Leh. Where you can feel the beauty of Himalayan range that is just an extraordinary beauty, Leh is the perfect mix of natural exquisiteness with artistic vision, your journey towards Stok kangri starts from Leh Ladakh situated in the northern territory of India and is celebrated for sympathy and backing of its inhabitants. Leh the capital of Ladakh is arranged at the tallness of 3500-3800 m of ocean level and the bravest destination for the trekking lovers. Trekking in Leh is the best and it grabs the attention of the visitor from each edge of the world. Invest some energy to adjust with the excellence and climate. Leh is where you get the ideal mix of natural perfection with social magnificence. The entire way to the Stok Village is brimming with ordinary greatness and thriving green trees. It is a spot that offers joy to everybody. This fascinating territory has many water bodies. Remaining here during the tents is an actual existence time opportunity. You will rest here for one total day and get satisfactory learning pretty much every one of the potential outcomes and difficulties of the trek from your guide. From here, you will trek to your goal Stok Kangri. Rise to move for 9-10 hours, and you will reach the highest point of the edge. Remaining at the summit, you can see the Karakoram Range to your north and Zanskar Range to your south. At your front, the broad and open ground gives you a lofty vibe. This trek offers you the unfathomable trekking knowledge. Stok Kangri is one of the most elevated trekking crests on the planet. It remains at the height of 20,100 Ft. It beats two of the highest mountains crosswise over two different landmasses and is, indeed, a delegated gem of India. 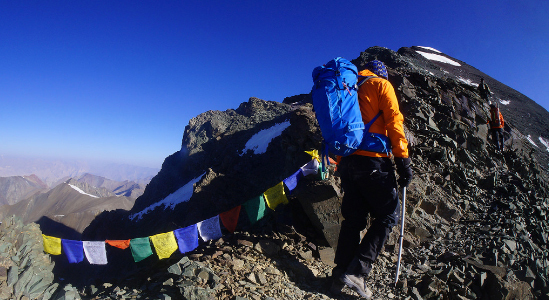 The greatest and the primary test amid Stok Kangri trek is the summit day, where you need to overcome below zero temperatures, trek on an icy mass for around 6-7 hrs during the evening, and stroll on the ridgeline for about two hours to achieve the summit. The view from the Stok Kangri summit merits the entire daunting struggle. Stok is an ideal undertaking and each energetic trekker's fantasy. Stok Kangri is one such pinnacle that has increase gigantic prominence over the most recent couple of years. Delineating the Himalayan range with a more extensive viewpoint, and offer its trekkers the chance to encounter the total harmony. The whole trail has numerous edges so you can feel the sudden change in landscape. In winter, the entire scene accomplishes an ideal gloriousness. Your trek starts from Delhi as you take the flight or the road trip to reach the destination from where the real adventure begins. 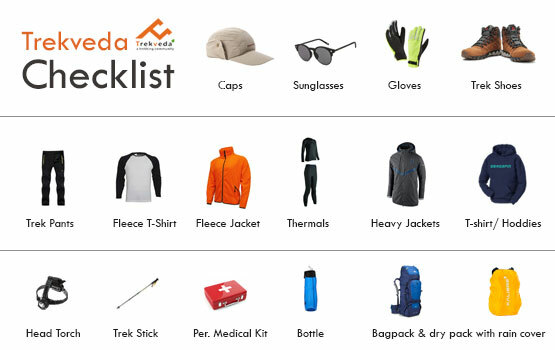 Trekveda provides you all the necessary equipment for trekking at Stock Kangri Trek from tents to ropes. In addition to that, our trek leaders also ensure the safety by various safeguards they take from time to time for your safety. Microspikes are provided to attach to your shoes which help you to keep the traction on the snow and make it easier to climb. An additional gaiter is provided to cover the snows which prevent the entering of snow into the shoes. Customized tents are provided to the trekkers which ensure the warmth and temperature 10 degrees higher than the outside coupled up with high-quality sleeping bags which can endure the temperature up to 15 degree Celsius below the freezing point. Trekveda, keep all your nutritional and hydration requirements on its checklist, our trek leaders will guide you to keep your body hydrated on the high altitudes Stock Kangri Trek as de-hydration can attract to the severe medical emergencies while trekking. Problems like Acute Mountain Sickness can prove fatal at Stock Kangri Trek if not taken into consideration seriously on time. If you face any of the symptoms such as a persistent headache, fatigue or weakness, nausea, dizziness, loss of appetite, difficulty in sleeping, you shouldn’t let it go or treat it by your own either just inform your trek leader. Stock Kangri Trek trek is a difficult trek which is suitable for experts. Who have at least physical and mental conditioning for doing the difficult trek. Getting to the Stock Kangri Trek without proper preparation is something you should never do. Cardiovascular exercise is one of the most sought-after methods which provides not just the physical endurance but also the strength to withstand any unavoidable circumstances sternly. Trekking at Stock Kangri Trek demands the high endurance which you can develop in few months depending upon your physical condition, where you need to begin with the jogging or running (only if you could do). This practice needs to be combined with the speed and distance targets. You need to keep on increasing both with the time. Another vital area of improvement, you need to work upon. Before you head to the Stock Kangri Trek, you need to have the physical strength in order to carry backpacks on the uneven terrains. Considering everything under the sun, you ought to prepare yourself for the core strength. A strength would be making you suffer less than others who don’t prepare before it. To pacify yourself or any other companion, yoga and meditation are the keys. These practices not only give you the mental peace but also provide you with a placid inner conscience which is extremely important in order to withstand the cons during the Stock Kangri Trek. The trek expense of Rs. 19,250 + 5% GST takes care of all expenses of the trek from Leh to leh. Backpack offloading charges - If you wish to offload your backpack, there will be an additional charge of Rs. 3200 + 5% GST. The backpack cannot weigh more than 9 kgs. Suitcases/strollers/duffel bags will not be allowed. Please note that charges will vary for last minute offloading in case you decide to offload your bag after reaching the basecamp (Rs. 3500 + 5% GST). Online offloading in advance is possible up to two days prior to the trek start date.